A survey carried out by the Financial Services Union and the Danish Centre for Alternative Social Analysis examines the causes of consistently high levels of stress in the financial services and insurance sector. Comparing the figures with those of 2001, the trends indicate more standardised work for some employees but more highly flexible work for others – in the latter case, to the extent that the conditions of work are practically without limits. Such ‘limitless’ work, which seems to be on the rise, is a contributory factor in the increased prevalence of stress. In April 2006, the Financial Services Union (Finansforbundet), in cooperation with the Danish Centre for Alternative Social Analysis (Center for Alternativ Samfundsanalyse, CASA), published the results of an investigation of the working life and psychosocial work environment (in Danish, 2.7Mb PDF). The survey questionnaire used scales designed to measure the psychosocial work environment developed by the National Institute of Occupational Health (Arbejdsmiljøinstituttet, AMI), and was completed by 2,819 random members of the Financial Services Union between January and March 2006. The union, representing approximately 50,000 employees in the financial services and insurance sector, carried out an almost similar survey on the psychosocial work environment (in Danish, 790Kb PDF) in 2001, which makes it possible to assess development trends and comparisons. The 2006 survey reveals that there are consistently high levels of stress in the financial services and insurance sector, as almost 30% of the respondents reported being stressed in 2001 and 2006. On closer examination, it appears that slightly more respondents in 2006 (2.9%) than in 2001 (1.7%) reported experiencing a very high level of stress. 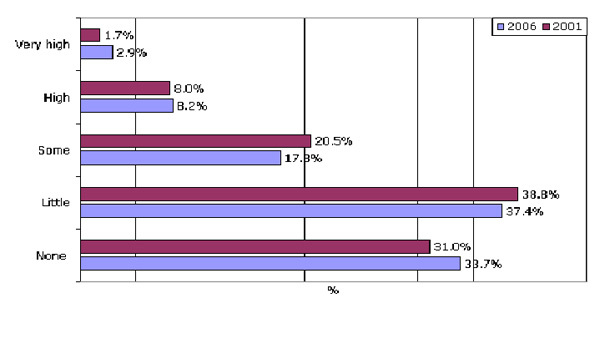 However, the proportion of respondents experiencing some stress declined from 20.5% in 2001 to 17.8% in 2006. 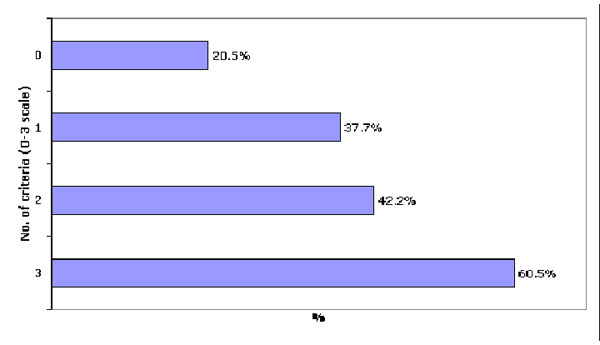 In addition, more people replied that they were not at all stressed, increasing from 31% to 33.7%. Overall, however, the prevalence of stress is stable, as the variance from 2001 to 2006 may be random. Notes: The respondents were asked: ‘By stress we understand a situation where you feel tense, restless, nervous or anxious, or cannot sleep at night because you think of problems all the time. Do you currently experience this kind of stress?’ By this measure, those responding ‘very much’, ‘much’ and ‘some’ are considered to be stressed. Source: Financial Services Union, Smil du er på – en undersøgelse af arbejdsliv og psykisk arbejdsmiljø i den finansielle sektor 2006, Copenhagen, 2006.
job security – fewer respondents report feelings of job insecurity. The most commonly applied theory in investigations of occupational stress is the job demand–control–support model (JDCS), which assumes that job demands should match levels of control or autonomy as well as support from colleagues. This model anticipates a decrease in the prevalence of stress in cases of an improved psychosocial environment. However, the survey findings reveal that, despite the progress identified, stress levels have remained constant. more employees work longer than the standard full-time working week (37 hours) – 19% of workers did so in 1993, but this had increased to 48% in 2001 and again to 57% in 2006. In addition, two distinct developments can be identified with regard to jobs in the financial services and insurance sector. The first trend is that more employees are reporting that they more often than in the past have to repeat the same operations at regular intervals of a few minutes as part of their job: this proportion has increased from 16% of workers in 2001 to 23% in 2006. Furthermore, fewer employees report that they can decide how to perform their work: this proportion has decreased from 75% of workers in 2001 to 71% in 2006. Together, these two conditions indicate the increasing tendency towards a standardisation of work procedures by means of information and communication technologies (ICT), similar to the situation identified in the call centre industry (DK0506NU01). The second development has moved in the opposite direction of the restricted practices found in the first scenario, as certain jobs have become highly flexible – to the extent that the conditions of work are practically without limits or boundaries. ‘Limitless’ work (grænseløst arbejde) is a concept introduced by researchers in order to describe jobs that are characterised as not being fixed to a certain location, not having to be performed within a certain timeframe and being less permanent in terms of employment relationships and tasks to be undertaken, often organised around project-based work. The limitless job is typically characterised by high job demands, long hours, high job control and greater stress. Figure 2 shows stress levels for employees divided into four categories in accordance with the degree of ‘limitlessness’ of their jobs (on a 0–3 scale). The more limitless the job, the more stressed the employees are. Notes: Respondents are divided according to how many out of three criteria they meet, from 0 to 3. The criteria are: 1) undertake work while travelling or commuting; 2) undertake work, read emails, etc outside office hours; 3) long working week (45 working hours). suffering from insomnia to some degree. It therefore seems that stress is intrinsic to limitless work, and that the trends indicate that such highly flexible work is becoming increasingly common in today’s labour market. For more information at European level, see the EWCO topic report Work-related stress (TN0502TR01).